This Paleo waffles or pancake recipe is made using 3 real food, clean eating ingredients. A quick blender recipe for a delicious healthy breakfast that’s SO easy, even kids can make them! Make sure you have a good butter or vegan spread to coat the waffle maker. Place eggs, egg whites, and banana in blender or use hand blender to blend by hand. Don’t have a blender? No problem, mash until thick batter is formed. Mix in your coconut flour and blend again until smooth. Place batter in fridge to chill for 20 minutes. Heat a waffle maker on medium high. Coat with butter or vegan spread. Topping ideas – maple syrup, sugar free powdered sugar or regular powdered sugar, fresh berries, butter, etc. 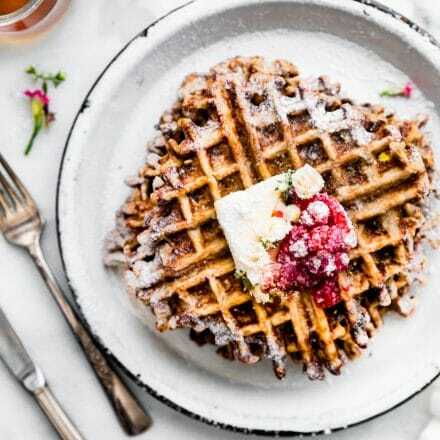 To reheat waffles, place frozen waffle in toaster and cook until heated through and crisp on the outside. This batter can also be used to make pancakes. Be sure to chill batter first.